Fishing for bass is not just throwing out a red wiggler worm then waiting for a bass to wander by. There is so much more to bass fishing than most people can ever imagine. I could write an entire book on it from an amateurs point of view. Maybe some day I'll do that but for now, I'd much rather spend my time fishing and catching. Fishing for bass really involves more time "fishing" than "catching". If you've explored this site you know that fishing and catching is what this site is about. There is more to bass fishing than catching. A whole lot more and it's all fun. We know that there is much joy in fishing but the adrenaline rush comes with the catching, that is, "hooking up". So let's look at a few aspects of "fishing" that can get you closer to the catching part of bass fishing. To be successful in "catching" bass an angler must understand the relationship between structure, cover, edges and deep water. These function together in attracting and holding bass. Structure is a change in the bottom contour of a body of water which, by its shape and size, changes the depth of the water. Structure is home and highway to largemouth and smallmouth bass. It is the bottom terrain they travel along, around and over to live, love and eat. It is well known that bass are home bodies" who do not travel far from a generally defined "home" area of their lake or river. Where they may be at any given time within their "home range" and to which structure they are relating in their range is determined by the conditions of the water and weather within each season. They may be deep or shallow as they travel back and forth between depths. It should be noted that structure in natural lakes is less plentiful and this makes fishing for bass in these more difficult in some regards than in reservoirs. However, natural lakes often have an abundance of grass, which is a bass magnet, and is sometimes woefully lacking in many highland reservoirs. Structure is found in all shapes, sizes and at many depths. All structure offers different fishing situations and opportunities. 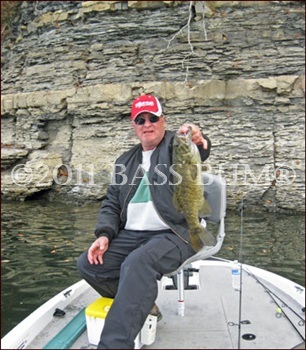 For example, the bluff wall behind "Mitch" in the picture above is classic structure and a bass magnet for smallmouth in fall and winter. Points and secondary points are considered by most to be the primo structure of all structure. Humps, which might be considered small underwater islands, often attract bass as well. Submerged islands, which are significantly larger than humps, offer similar fishing opportunities that are found with points. Bluffs are magnets for bass as they are filled with undercuts and cuts that provide bass hiding places for ambushing prey. There are cuts in bluffs which offer both deep and shallow water and draw bass as a consequence. Saddles are characterized by two high areas with a low area between them thereby providing both depth and shallow areas for bass. The most important aspect of any structure is the edge. Edges define changes in water depth with structure. Edges on structure are where the bass are. Cover is any object that rests upon the bottom and is not an integral part of it. 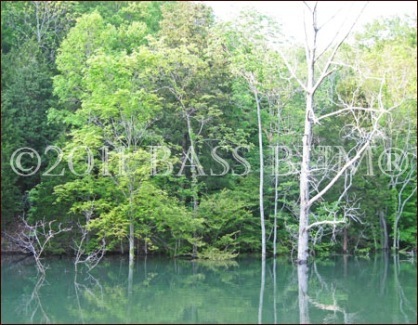 For example, the trees in the picture below are a high percentage cover feature for attracting bass, especially in Spring. Bass will locate at their bases and ambush prey. Structure is important in and of itself when fishing for bass but structure combined with cover is a home run. Bass will use the shade created by cover as a hiding place from which to ambush their prey. The best cover is that which is located on structure, especially at intersections of structures where angles are created. Find structure with cover close to deep water and you're close to striking bass gold. Like structure, there are also many different types of cover. Some of the most productive when fishing for bass are weeds, grass and wood, such as stumps, submerged timber and laydowns (fallen tress). Docks, rock piles, even individual rocks are good cover as well. When bass are to be found in cover and in what type cover they are to be found, is determined by weather and water conditions which vary, not only with the seasons, but daily within the seasons. I mentioned above that a key element of structure is an edge, which is a change in water depth. Edge's are also important with some covers, though an edge around cover is a different type edge. Cover edges are not necessarily depth changes but are actual edges, like the edge of a grass bed or a place where one type rock changes to another type. Like a transition from large chunk rock to pebble stones. It's a little bit different if your river bass fishing. Add "current", current breaks, riffles, pools, runs and eddies to the equation. Seasonal changes and the weather they bring impact the behavior of bass and how they relate to structure and cover. "Weather and Seasons - Generally Speaking"
In early spring bass will begin moving shallow to feed and stage for spawn. But spring fronts, especially cold fronts, can have profound impact on bass. They tend to "feed up" as a cold front approaches so you may well find them around shallow structure and cover. They will be aggressive and strike aggressively worked lures. However, once the front passes they tend to hunker down in cover and feeding activity drops, sometimes for days. After spawn bass, particularly largemouth, tend to spread out while focusing on aquatic vegetation like coontail, hydrilla, milfoil and others. As summer creeps in gradually bringing the oppressive heat of summer, bass will begin to move away from shallow water traveling to water greater than 15´ in depth. Here they will take up temporary residence on ledges (edge), especially those with cover, that are part of points, humps or islands moving to and fro from deep to shallow water. This is where the baitfish will be so there too will be the bass. Fall brings shorter, cooler days and longer, cold nights and finds bass chasing baitfish into creeks and coves. Aquatic plants begin to die back and bass eagerly move in to feed because there is less cover in which their prey can hide. Baitfish will move from their summer haunts to coves and creek arms to spawn and guess who follows? Ole Bucketmouth and Smalljaw. When winter finally makes it's rude arrival fishing for bass loses its appeal to many and they head inside, grab a beer and plop down in front of the fireplace or heater. Fishing for bass in cold, wet, overcast weather loses its appeal for many anglers. Bass do something similar. They head for deep water structure where they will set up house in the deepest water they can above the "cline" and wait for spring. Don't get me wrong. This does not mean they won't bite if you find them. But we'll talk about this on another page. Winter Bass Fishing Means Big Bass, They Slow Down, Not Hibernate!